The sands of time may be running out for the Board of Control for Cricket in India (BCCI). But if those tracking the progress of the case in the Supreme Court are surprised by the unhurried stance of the nation's highest court, they have perhaps missed seeing how deftly Chief Justice TS Thakur and his colleagues have been driving the Board towards the implementation of administrative changes. On Thursday, the Supreme Court brought up the suggestion that BCCI president Anurag Thakur may have committed perjury. He is said to have sought to obstruct justice by apparently trying to get the International Cricket Council to infer that the appointment of a CAG nominee in the BCCI would amount to government interference. With the BCCI chief in the Chief Justice's cross-hairs, Anurag Thakur has no option but to tender an apology. Since the court's order may be a bit less harsh than its observations during the hearing, an unqualified apology may rescue Anurag Thakur in the end. But he could be spending some time chewing a few fingernails, if not exactly spending sleepless nights. 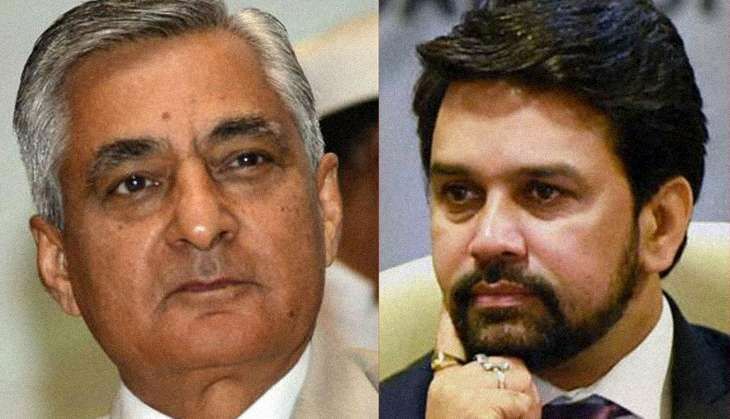 However, more than Anurag Thakur's fate, those who have willed the evolution of cricket administration in the country will be eager to see how the Supreme Court gets the BCCI to implement the changes ordered by the Justice Lodha committee on 4 January this year, and approved by the court on 18 July. When it filed its third status report on 14 November, the Lodha committee sought three primary directions from the Supreme Court. 1. It wanted all office-bearers of the BCCI and state associations who would be disqualified if the committee's recommendations were implemented, to be ordered to relinquish office. 3. To make GK Pillai supervise the administration of the BCCI. Now that the Court has given the BCCI a week to come up with the names of administrators who can run the game on a day-to-day basis, it is clear that the court is finding ways to make the Board seem like it is doing things on its own. The court has adeptly stopped short of accepting the Lodha panel's choice, former Union Home Secretary Pillai to manage the Board's day-to-day work. However, the Court has not given much indication on its line of thinking on the other two primary directions sought by the Lodha panel. Perhaps the Supreme Court itself realises that it may have over-reached a bit when it endorsed the Lodha committee's recommendations in totality. Instead of backing off - and setting a precedent that could be cited many times in crucial cases - it is now seeking to make the Board appear to embrace the changes ordered, even if wrongly in some instances. Over the last six months, it seemed fairly clear then that the Board - and its affiliates - would have to comply with the Lodha committee recommendations. And while there has been consistent defiance in this time, it does come as a surprise that the Supreme Court has not initiated contempt of court proceedings against at least some of them. In cricketing terms, the Supreme Court seems to be unwilling to enforce the follow-on despite a massive lead. Instead, without a semblance of hurry or impatience, it has placed the BCCI at the receiving end of much misery at each hearing in the Chief Justice's courtroom. Indeed, it can only be seen as a slow but painful process, with the eventual outcome written on the wall, in large and bold letters. Perhaps, some of the brinksmanship - and there can be no other way of seeing these actions - is rooted in the fact that Chief Justice TS Thakur will have to relinquish office on 4 January, upon turning 65. However, it would be wrong to assume that Justice Jagdish Singh Khehar, who will take over as Chief Justice, will be any more lenient than his predecessor, especially in this high profile case. Will state bodies break ranks? The road before the BCCI was clear and simple - at least to dispassionate bystanders. All it had to do was appear to fall in line with the Supreme Court's wishes by making the changes asked for, and then attempt to convince the court that not all of the suggestions coming from the Justice Lodha committee were practical or desirable. With the BCCI's review petition being turned down by the Supreme Court, time is running out. An influential source close to the Lodha committee has suggested to some mediapersons that it would suggest that the upcoming Tests against Australia be hosted only those state associations which comply with the panel's recommendations. This, obviously, will set the cat among the pigeons. The time is not far when the Board and state associations, as we have known them, will ring in more changes and embrace professionalism - seemingly voluntarily - to such an extent that few will be able to point fingers. Issues like conflict of interest, a person or clique's stranglehold on administration and other forms of corruption may have little room to stage a comeback. By cutting off the financial supply lines to non-compliant state associations rather than haul them up, the apex court has ensured they have to walk a tightrope. It may not be long before the associations break ranks and fall in line, more so with the Board chief facing a serious threat of being indicted for perjury.